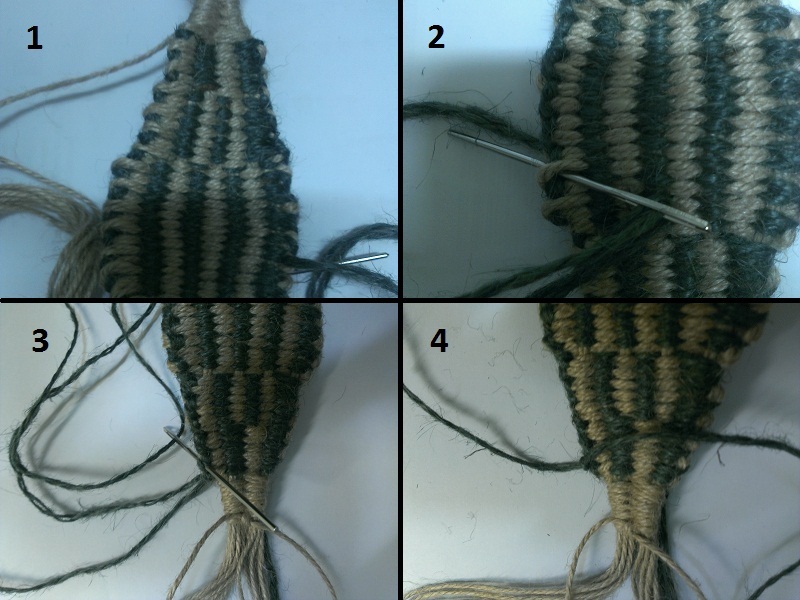 (http://slinging.org/forum/YaBB.pl?num=1366011861), let´s go to the next level and make a striped woven pouch. This time the pouch will not end with multiple loops, where the cords can be attached, but the cords will be integrated directly into the pouch. If you want to make a pouch design with the loops like in tutorial #1 you´re free to do so, the weaving instruction works for both types. 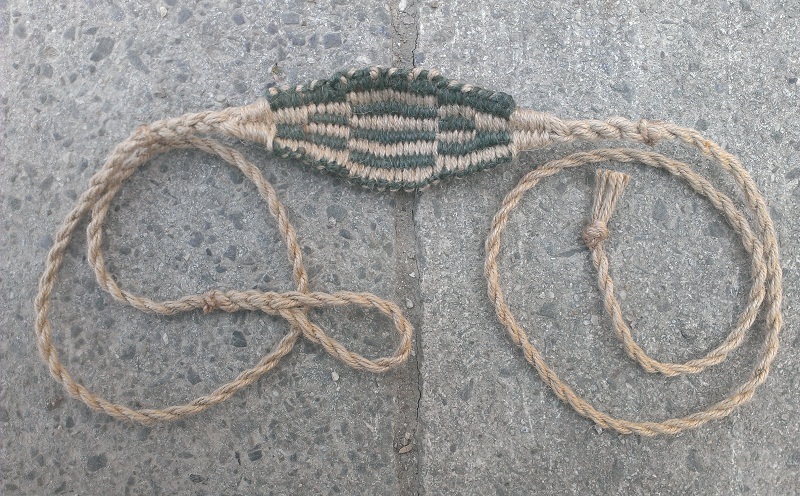 For the demonstrated sling I used thin jute cordage, therefore I worked with doubled strands. If you have thicker cordage, you may use single cords. You`ll need cordage in two different colors, a needle for weaving, scissors or a sharp knife, some glue and a “loom” that can be everything that`s flat and hard. I used an amazon envelope made of hard paper, where (for having a good background) a white sheet of paper was attached to. Take 8 strands of cordage that folded into half have the length of the future pouch + enough length for braiding the cords + some additional 6-8 inches. 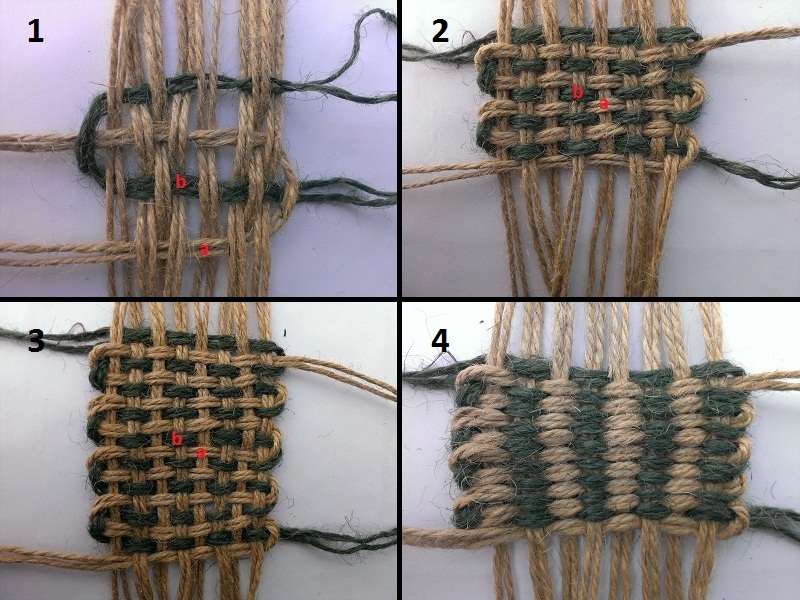 Divide your folded strands into two groups and position them over the loom as shown in picture 1. Turn the loom and the cords around and pull the longer strands of each group through their corresponding loops (2) on the backside of the loom. Tie the free ends together with a knot (3) and turn around the loom (4). Now you can start weaving. You`ll need a (double-)cord of approx. 5,5-6m for each color. 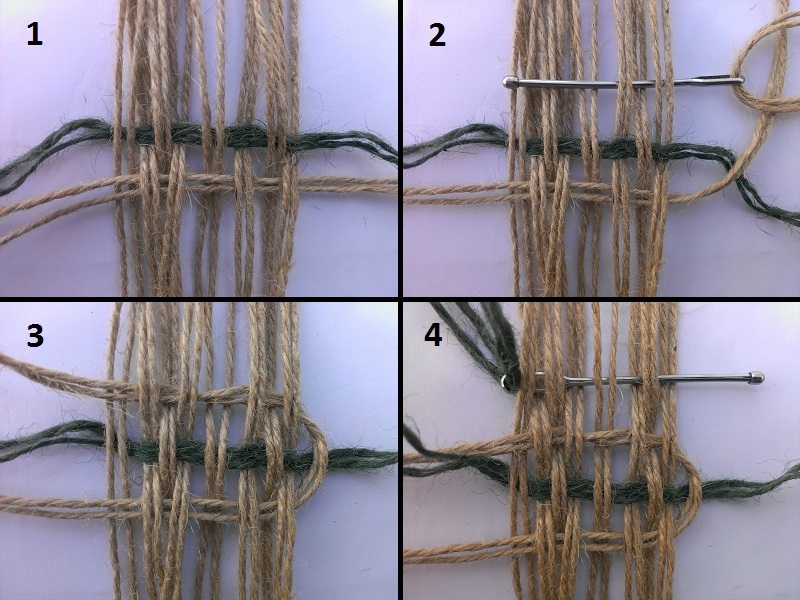 (1) Start from left with a simple up-down-up-down… weave over 8 (double-)warp-cords (here: the brown double strand). Pull the weaving cord through, until the free ends on the left and right have the same length. 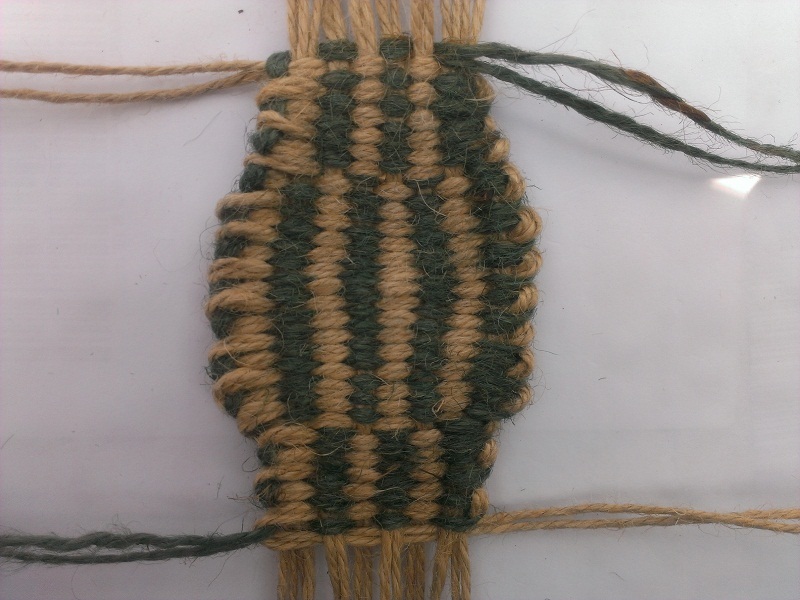 Do the same with the cord of the other color (here: the green one) above the first row, only that you weave in the opposite manner, i.e. down-up-down-up… . 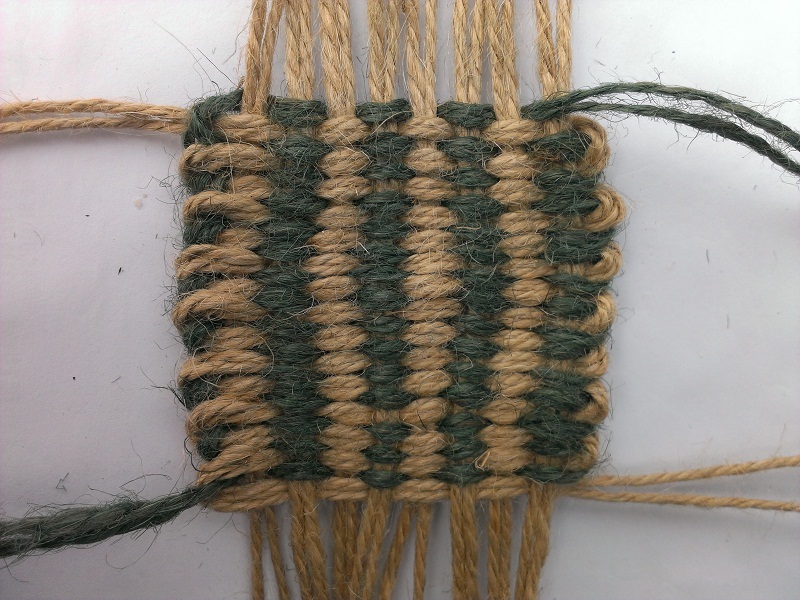 (2, 3) Now weave again with the brown cord, first crossing over the green, than under the far right warp and complete the row. (4) Proceed in a similar way with the green cord. The result will look like picture 1. The red letters a and b indicate your first woven rows. A brown row followed by a green one above will be called a double-row. Weave two double-rows above and two below the first double -row (2). In picture 3 there are two more double-rows on each side added. Now it`s time to tighten the weft by pushing the rows together in the vertical direction. 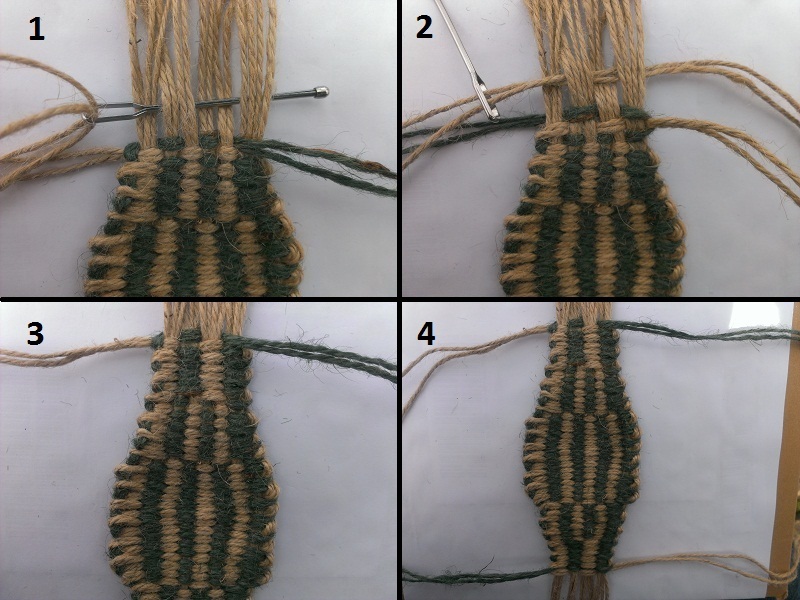 You may hold the corresponding warp cord when you push a part of the weaving away from it to the center. On picture 4 you can see that the tightened weft formed brown and green stripes. Add some more double-rows on each side until you have totally 15 (if the lowest cord is brown and the upper one is green simply count the (double-)strands in one stripe and you get the number of double-rows) and tighten the weft again. 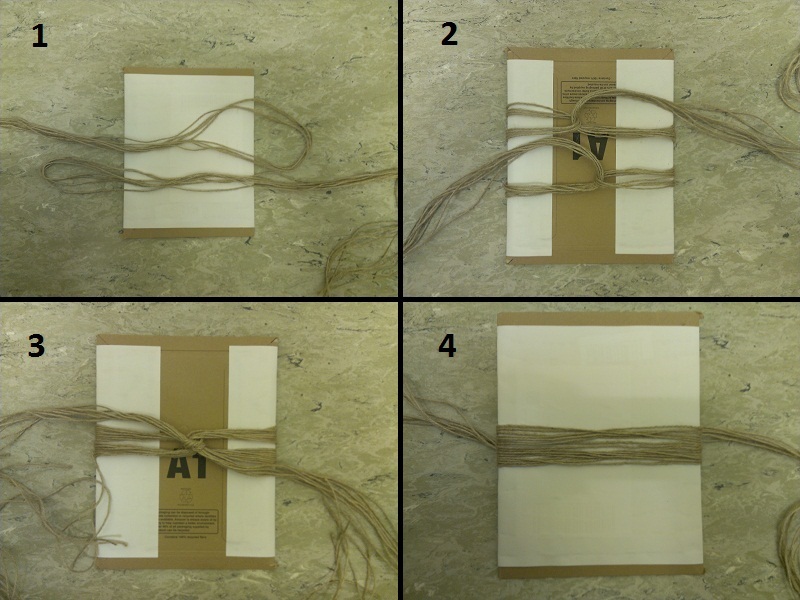 Now the number of warp-cords is reduced from 8 to 6 by taking the outer warps together as indicated in picture 1. 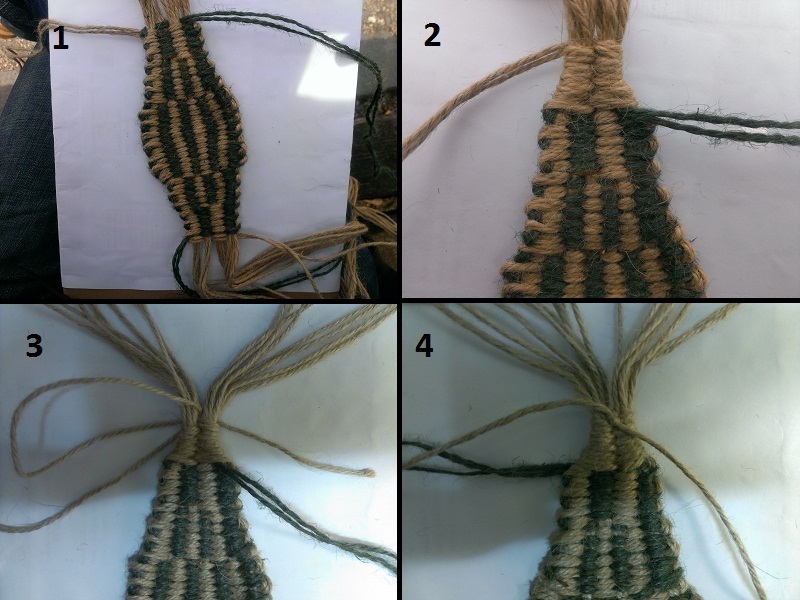 Continue weaving, always alternating brown and green cords (2) and reduce the width of the pouch by weaving tighter than you did in the center of the pouch (3). After pushing the rows together you`ll observe a change in the stripe-pattern. 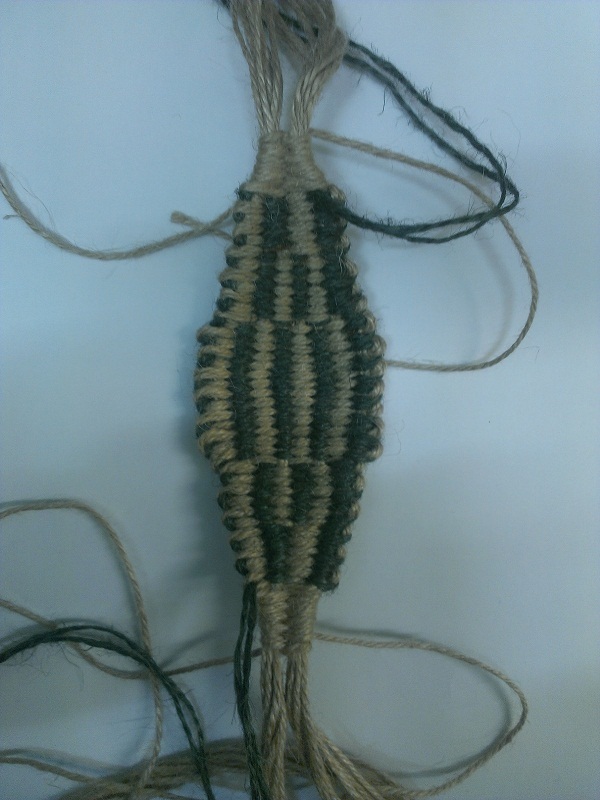 Repeat the weaving with 6 warp-cords on the other side of the pouch and you`ll get a result like this. Again reduce the number of warp-cords, now from 6 to 4, weave again tighter than you did before to reduce the width of the pouch. Make 6 double-rows on each side. Now untie the knot on the backside of the loom and detach the pouch from it (1). Take the brown (double-)strand that comes out on the top left and make a two-warp-weave up-down-up-down until you count 5 loops on each side (2). Then take the upper of the two strands (or if you work with thicker single-strands, then untwist the cord and take one part of the resulting thinner strands), and make another turn over the left warp-group (3). Turn around the pouch and tie the two strands together (4). There should be a strand between the two ends, so the knot remains on the backside. Repeat the last steps on the other side of the pouch. 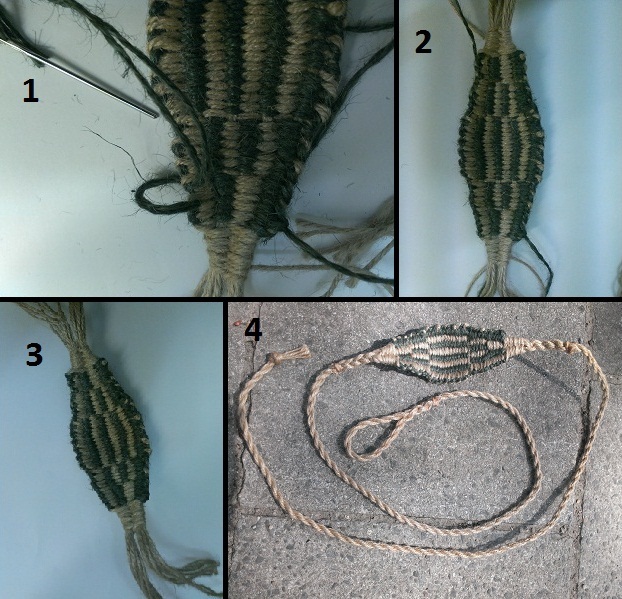 The picture shows the resulting pouch (again from the ammo-side) with the remaining green weaving strands coming out of the pouch top right and below left. Take the weaving strands coming out top right and sew them around the right border of the pouch (1). 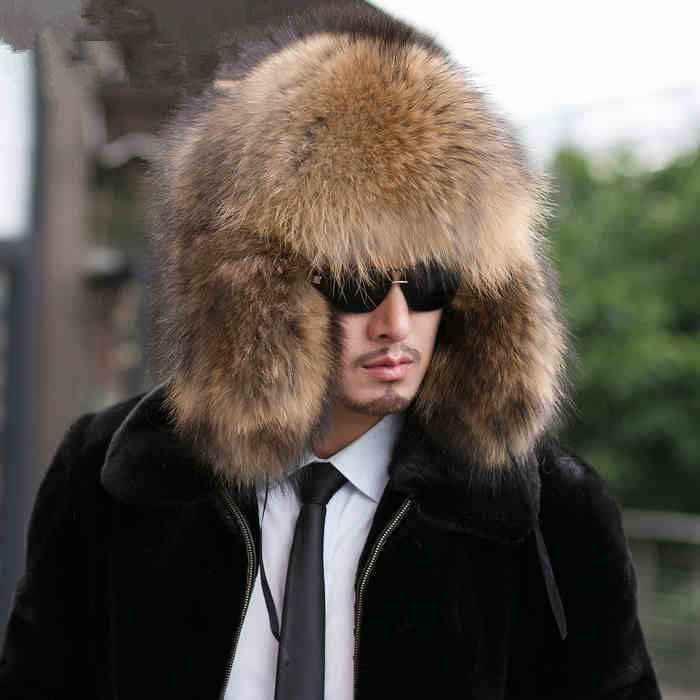 Sew in a way, where the bigger visible parts of the brown loops are hidden. You can see this in picture 2, where the backside of the pouch is shown. At the end sew one step with only one strand (or a part of an untwisted single strand, if you worked with such one) and tie a knot at the backside (3, 4). 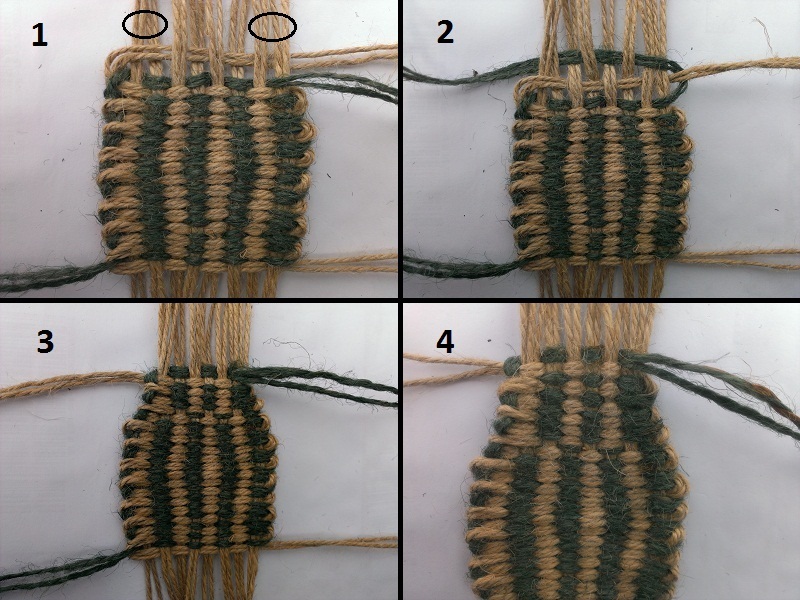 (1) Now take the other weaving strand(s) below left and start sewing upwards the left border. If you made the pouch the same way like shown in this tutorial on this (left) side the brown loops should be at the ammo side (=inside) of the pouch. Sew again hiding the bigger parts of the loops. (2) After you`ve made the knot, the pouch should look like this. (3) Secure all knots by adding a drop of glue on each one and trim the ends. Here you can form the pouch for a last time by carefully pulling the warp strands, until the pouch gets the desired cupped shape. Then make cuts to open the big loops on each end (release and retention ends) of the pouch. You`ll get now 4 long and 4 short (double-) strands on each side. The short strands have to be worked into the release and retention cord by braiding or splicing, depending in which way you make the cords. As it`s quicker I made reverse twisted cords and used splicing. The finished sling you can see on picture 4. Have fun with your new shepherd sling! Thank you lakeslinger. Another great tutorial and a beautiful shepherds sling! Great tutorial, thanks again! I have added it to the FAQ tutorial list.